Our Open Day took place earlier than usual this year, on Sunday 24 April. This meant that it was much colder than in previous years and the weather probably contributed to a lower than normal turnout. However, in croquet terms, the quality of those that did turn up, taking into account how they took to the game, made up for the lack of quantity. It was also noticeable that we had a greater number of younger participants than usual. 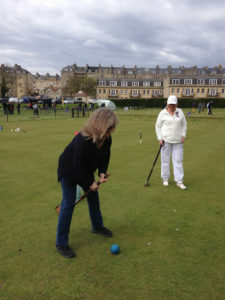 The croquet instruction was carried out by members who had volunteered for the task and it was soon obvious that a number of the newcomers were taking to the game very quickly. This was verified by the number that stayed on to play full games of golf croquet after the instruction had finished. We also laid on a number of croquet “party” games including our version of the old pub “shove-halfpenny” game and “hit the peg” or “run the hoop” from as far away as possible. All of these games raised money for Dorothy House, who also supplied tea and cakes throughout the day. All in all, a successful if cold day, which raised money for Dorothy House and contributed to 12 newcomers signing up for our course of 5 beginners’ lessons.